Before I received the email outlining this trip, I knew pretty much squat about the Azores. Well, I knew it was a bunch of islands in the Atlantic, but that was about it. I didn’t realise quite how far off the coast of Portugal they actually are - the archipelago is getting on for halfway between mainland Europe and the most easterly bit of Canada. I had no idea the islands were formed by volcanoes, making the scenery rather dramatic. 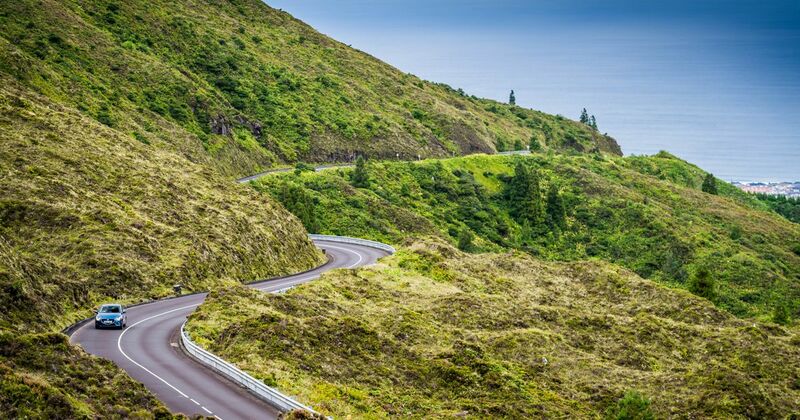 Nor did I know that the largest island - Sao Miguel - is home to some of the best driving roads on the planet. 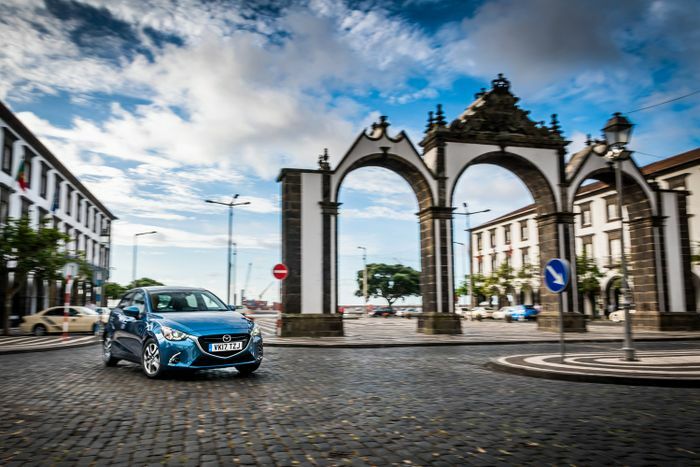 So, upon landing in Ponta Delgada - the most populous settlement in the Azores - what kind of car do you suppose might be waiting for me? A Porsche Boxster, perhaps? The weather’s pretty changeable here, so how about an all-wheel drive supercar like an Audi R8? A hot hatch like the Honda Civic Type R might be pretty good, actually. However, the answer is none of the above. It’s a Mazda, and not even an MX-5. It’s the Ford Fiesta-rivalling Mazda 2, in 89bhp form. Ah. But there’s a very good reason I’m in something that doesn’t breathe fire and decimate rubber at the merest tickle of the throttle. 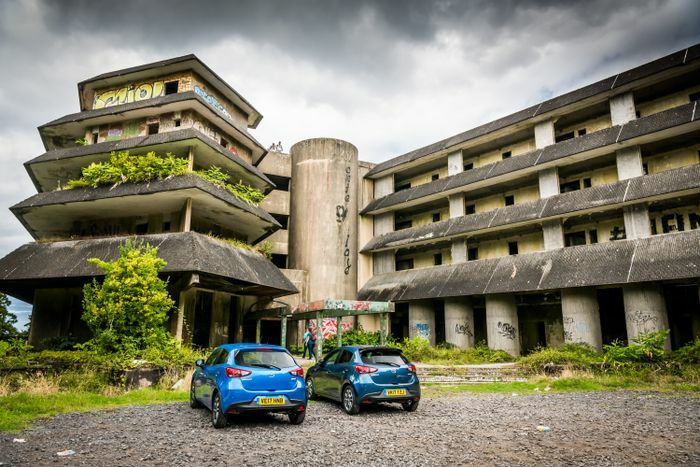 The trip is one installment in a series of road trips organised by Mazda called Epic Drives, intended to show that all its cars, regardless of output, are damn good to be behind the wheel of. So with an open mind, I twist the key in the ignition barrel to awaken 89 of the 1.5-litre, naturally-aspirated inline-four’s rampant horses. The gentle bimble out of Ponta Delgada reveals a town with a curious architectural mix. The vast concrete and glass structures of hotels and offices plus the industrial lots of the town’s massive port blend not so seamlessly with pristine white buildings dating back hundreds of years, flanking cobbled roads with a complete lack of pavements. Seriously, a lot of the properties here open straight onto the road - we’ve been forewarned to drive through populated areas with caution, lest we mow anyone down. It’s not a big town, though, so I’m soon leaving the strange mingle of buildings behind and snaking up a fiddly little stretch of tarmac lined by trees. It’s only now that it occurs to me that the 2’s driving position is spot on. Why hadn’t I noticed it before? Because it fits like a glove. A driving position tends to stick out if it’s bad - cough Abarth 595 cough - rather than good, and there’s nothing wrong with the 2’s ergonomics. I’ve been climbing for some time, but it’s not until I stop at a creepy abandoned hotel - opened for just one year before closing down and being left to rot - that I see what the trees have been hiding. 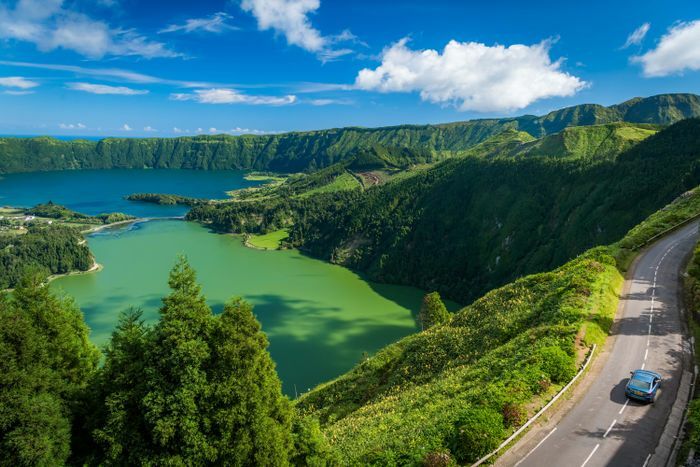 Climbing up the still-carpeted staircase - being careful not to take a wrong turn and fall down an empty lift shaft - I venture out onto the roof, where a ridiculously good view of Lagoa das Sete Cidades unfolds before me. What I’m looking at is a massive pair of lakes sitting in the crater of a dormant volcano, and it might just be the most beautiful bit of scenery I’ve ever clapped eyes on. Back in the car, the climb doesn’t stop. It’s now that the next piece of the puzzle makes itself apparent: the engine. The default position for most manufacturers when making a circa 90bhp engine these days seems to be a dinky 1.0-litre inline-three with a little turbocharger attached, but you’ll find no such thing in the Mazda. In a move that’s now looking like a masterstroke, Mazda has ignored the downsizing trend entirely, and has gone its own way by sticking with comparatively large naturally-aspirated units. Mazda must be feeling smug right now as aggressively downsized engines struggle to get anywhere near their claimed economy figures in the real world, but the benefits go well beyond efficiency. With inline-threes being inherently unbalanced, their crankshafts are festooned with counterweights, sapping responsiveness. No such issue with the 1.5-litre N/A inline-four in the Mazda 2, which is a revvy, eager not-so-little thing. The lack of low-down grunt does leave you with a dilemma, though. Do you leave it in third gear and struggle out of the lower speed corners, or favour second and have it buzzing near the limiter much of the time? Thankfully, knocking through the gears on the 2 isn’t a chore, as the car’s gearbox is much the same as you’d find in a Mazda MX-5, meaning you get a short and deliciously precise throw with every change. 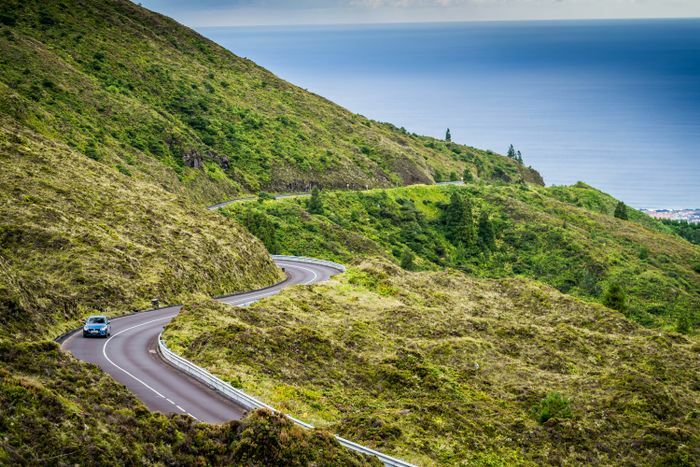 Having snaked back down toward sea level around enough hairpins for me to lose count, a few less interesting straighter sections await, followed by another climb. It’s now that that last piece of the Mazda 2 equation makes itself known: the super sweet chassis. Now I know where the hatchback’s easy-to-reach limits are, there’s a hilarious howl of tyre squeal on every corner. There isn’t masses of front-end grip, but it’s a neat and tidy little car when you throw it around, with accurate, feelsome steering that lets you place the nose wherever you want. 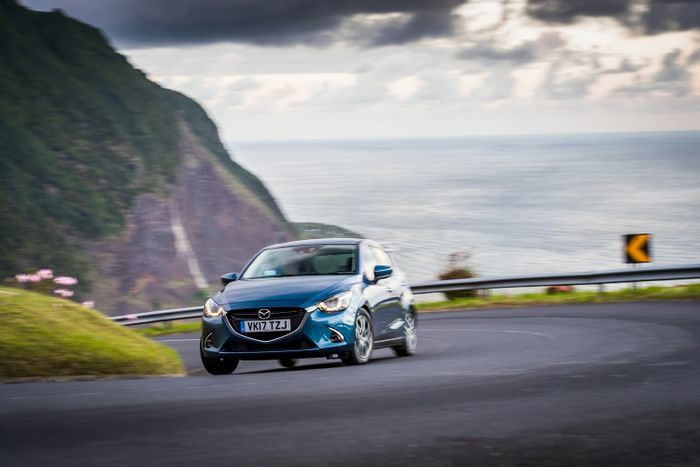 "On these roads, the Mazda 2's modest output is a blessing rather than a curse"
It’s well balanced and almost playful, too. Back off mid corner, and you get the slightest inkling that the back end wants to rotate forwards. I’m loving every minute of this drive despite the limited power on offer. In fact, the 2’s modest output is a blessing rather than a curse - you can really hammer this thing to within an inch of its life while remaining at perfectly safe and legal speeds. And in any case, these roads are so damn twisty, if you took something powerful here, you might find yourself a little frustrated. So is it mission accomplished for Mazda in proving that even the humblest of its products is properly sorted in the driving department? Yes, but there’s a pretty big caveat. 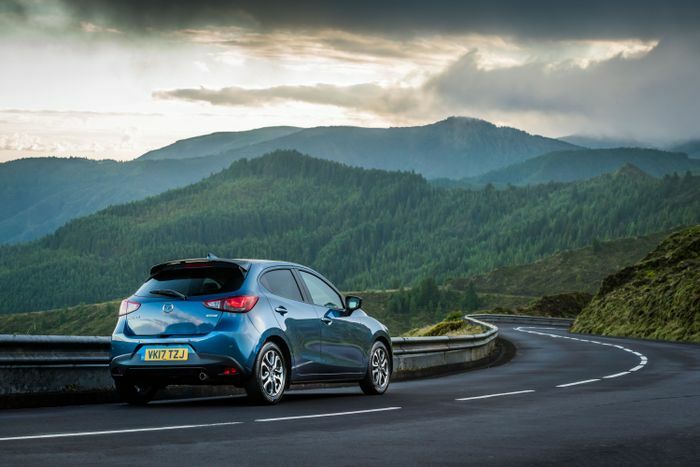 While I’ll happily doff my metaphorical hat to Mazda for its ethos that sees all of its cars imbued with commendable driving competence, in the case of the 2, it draws awkward attention to the fact that there isn’t a more powerful version. It’s such a wicked chassis with beautiful steering that you’re left wondering just how good the 2 would be with a little more power, slightly stiffer suspension and wider, stickier rubber. I don’t think it’d feel ‘too much’ on these kinds of roads, either.